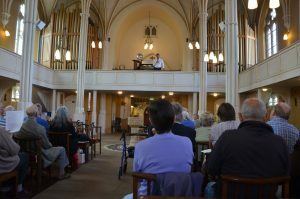 Jonathan Kingston gave us a fine prelude to StonyLive week with a joyful first Friday lunchtime organ recital on 1st June. It was preceded by soup and rolls for lunch when he mingled with the crowd who had arrived for music and food. 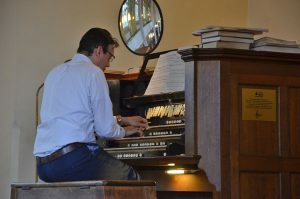 Jonathan introduced his choice of pieces with interesting anecdotes and explained that he had tried to pick a programme of music we might not have heard him play before, including a whole concerto by Handel and a beautiful contemplative Sicilienne by a female composer, Maria von Paradis. He started with the rousing Marche Militaire by Schubert. Later he contrasted the emiment Walford Davies 'Solemn Melody' with the jollity of Chelsea Fayre by Goss Custard. 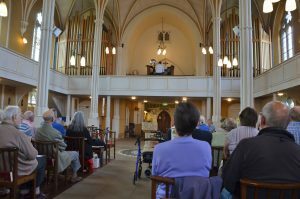 The exciting Toccata by George Mushel was a fine way to finish a very enjoyable lunchtime concert. Thank you Jonathan for playing and to all those who served soup and helped tidy up afterwards.